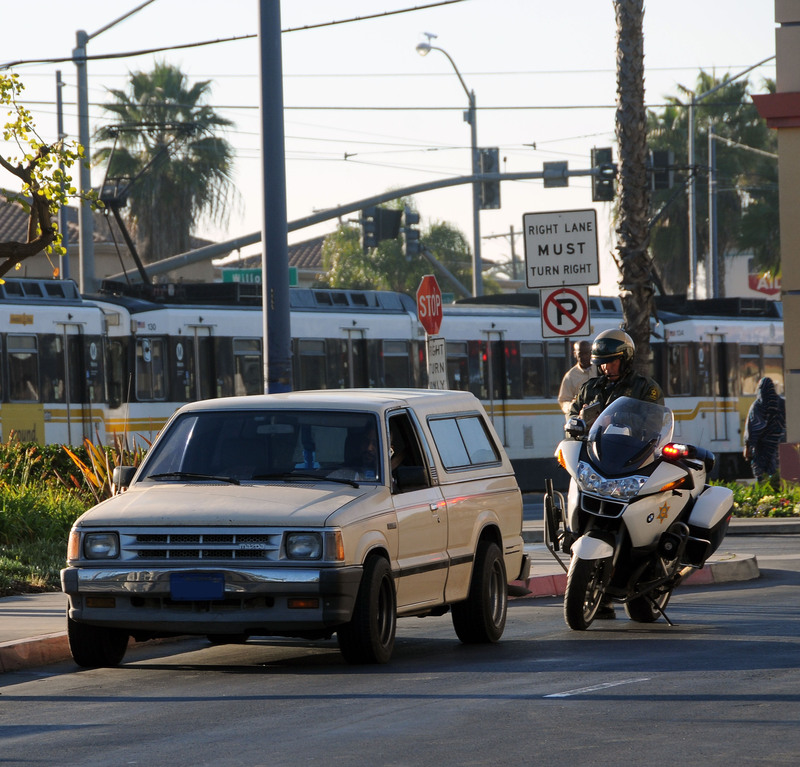 Eighteen motorcycle officers from the Long Beach Police Department and the Los Angeles Sheriff’s Department spent their morning hours in a special sweep of the area around Blue Line tracks in Long Beach, issuing citations to motorists and pedestrians ignoring safety laws. Police issued 106 citations in just over three hours. The crackdown focused on illegal left turn violators, jaywalkers and distracted motorists using handheld cell phones or texting. The operation was part of an ongoing effort to educate drivers and pedestrians about safety around Metro Blue Line trains. One way to drive home that message is issuing citations to flagrant violators who do not pay attention to rail warning signs, signals, flashing lights, crossing arms, bells and train horns. Fines averaged $450. Metro’s emphasis on educating the public, making engineering improvements and enforcing the law has sharply reduced overall accidents on the Blue Line, particularly collisions between trains and cars and trucks. However, pedestrians and motorists who aren’t paying attention to warning signals and signs or engaged in other risky behavior — such as jaywalking across the tracks — are an ongoing concern for Metro. The public shares responsibility for their safety. Metro Board of Directors Chairman Don Knabe and Board Member Diane Dubois were also on hand for the crackdown along with Long Beach Police Chief Jim McDonnell and Captain Daniel Cruz of the Sheriff’s Transit Service Bureau. It’s about time these Motorist, Pedestrians and Train Crossing violator be brought up to speed on Train Safety. All they have to do is: STOP, LOOK & LISTEN! I like that this is being done primarily because, hopefully, the data from these vehicle and pedestrian stops will be enough to exhonorate the Los Angeles County Metropolitan Transportation Authority from the ceaseless implications that lightrail is inherantly unsafe, and that they have been operating a death trap by running the blue line (I’m looking at you, LA newspapers). That’s nonsense and is rhetoric that has contributed, at least in part, to the lack of rail construction in our traffic-plagued city.